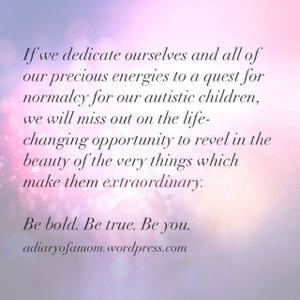 This is a very important post, I think, because it speaks to the individuality of each child (special needs or not), and our responsibility as parents to find the balance between protecting them by teaching them how to “fit in”/navigate society, and forcing them to be something they are not because we THINK it will make life easier. Life is never easier when you are not allowed to be who you are. My child is not typical. Trying to force her to be something that she’s not doesn’t work. Hey, mom, you need to be autistic now. Don’t worry; we’ll show you how. We’re going to give you therapy to make you autistic. We’re going to teach you to act autistic. That’s not who I am. Yeah, we know, but you’re going to have to get used to it. It hurts to be told that who you are is not okay. That how you see the world is .. wrong. That how you act is … wrong. That how you express excitement, show fear, communicate joy, share sadness, and, and, and .. are wrong. It is a life of No. My extended family has been touched by autism in different ways. Evey person’s experience with the autism spectrum is so very different. When a subject is important to me, I tend to jump in with both feet and learn as much as I can. So that’s what I did. I read books by Temple Grandin to start, then found blogs that opened my eyes to the many facets of the lives of people on the spectrum and the people who love them. I found inspiration, sadness, frustration, joy, humor, sarcasm, fear, trauma, love, friendship, appreciation, support, and most of all – Advocacy. This blog is a collection of these perspectives – it is my way of advocating for understanding and acceptance for those among us who face challenges every day.